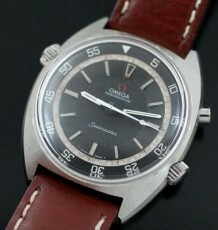 A very early Omega bumper automatic Seamaster, with a superb original dial with sub-seconds and thin arrowhead markers. 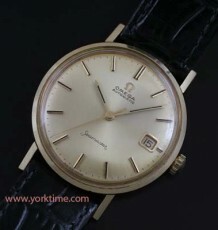 The Omega signed Wadsworth 14K gold-filled watchcase is in excellent condition with only minor brassing on the corners of the lugs. The case has very attractive teardrop shaped lugs. 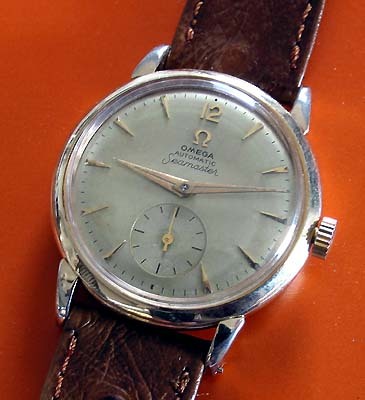 The Omega 17 jewel caliber 344 movement, has a 14,000,000 serial number dating it to the late 1940’s, which makes it one of the earliest bumper automatics made. 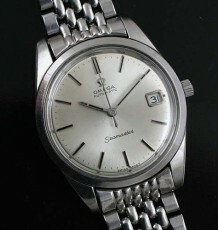 The watch winds effortlessly and keeps excellent time. 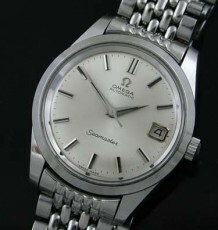 This watch dates to a period of transition of Omega and does not have a signed Omega crown, a newer replacement that is signed can be obtained if desired. The screw back case measures 33.5mm wide by 39mm long.